On April 12, 1961, the USSR launched the first piloted Vostok spacecraft with cosmonaut Yuri Gagarin onboard, opening the era of human space flight. Gagarin's launch vehicle blasted off into the cloudless blue sky over Tyuratam in Kazakhstan as scheduled, just a fraction of a second before 09:07 Moscow Time. 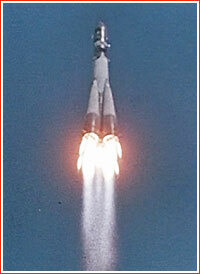 The ascent to orbit was successful, however, the main engine of the second stage fired around half a second longer than scheduled, hurtling Gagarin's capsule dangerously high. 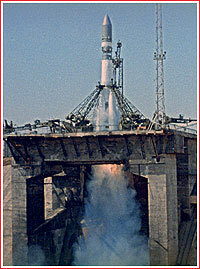 Vostok lifts off on April 12, 1961. At 05:00 in the morning, communications tests between the various ground control stations took place. 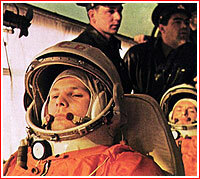 Gagarin and Titov were awaken at 05:30. They had "space food" for breakfast, which was followed by routine medical checkups. Both cosmonauts passed them with flying colors. 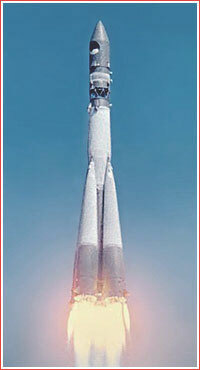 At 06:00, the car of the medical service arrived to the launch pad, delivering food to be loaded into the spacecraft. (229) In the meantime, the two cosmonauts arrived in the spacesuit processing room of the vehicle assembly building at Site 2. Contrary to popular descriptions, Gagarin put on his space suit after Titov to reduce chances of overheating and discomfort. The suiting up operations started with attaching of nine silver medical sensors to cosmonauts' bodies. Next, they put on thin white silk underwear with small slits to route wires for sensors. Next came the soft layer of the spacesuit, which included ventilation system, and grayish thermal layer. Finally, an orange exterior layer was put on top. Shoes were fixed to the spacesuit, but gloves with their metallic seals were only left strapped to the sleeves on strings to be put on inside the spacecraft. 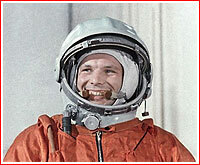 One of the onlookers in the dressing room semi-jokingly suggested that upon landing in his futuristic outfit Gagarin could be mistaken for the pilot of an American spy plane like the one that had been shot down over USSR in the previous year. The idea was taken seriously and officials made the urgent decision to paint C C C P (USSR) on the front of Gagarin's helmet in big red letters. A number of photos showing Gagarin in his helmet before and after the letters were painted confirm the authenticity of the story. One life-support engineer known for his calligraphic writing quickly accomplished the improvised task. Gagarin reportedly pleaded with the "artist" to be careful not to drop red paint on his nose. 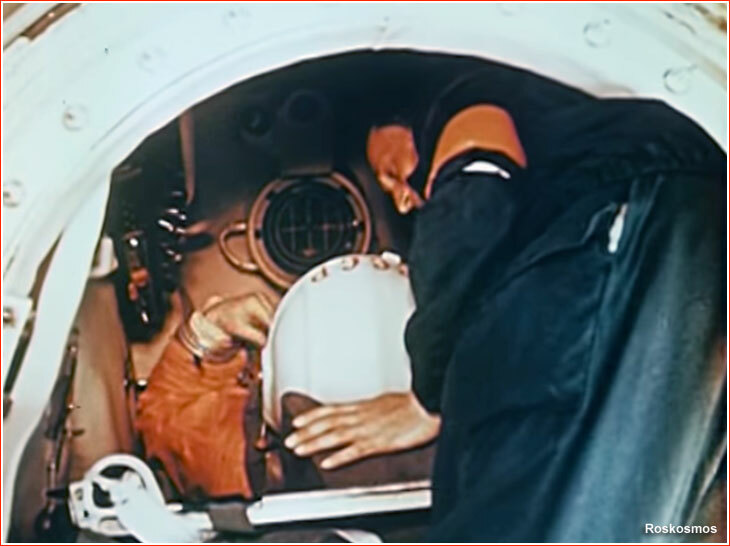 Upon suiting up, Gagarin spent a few minutes in the special test seat, as technicians were checking ventilation and other systems. 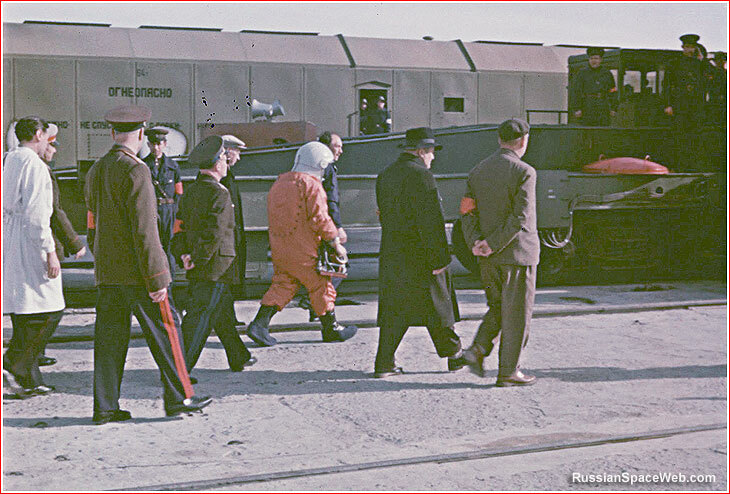 Then, accompanied by Titov, Nelyubov, Nikolaev and life-support engineers, Gagarin walked out of the assembly building and boarded a specially equipped bus for a ride from Site 2 to the launch pad. Gagarin's companions on this historic trip later disputed popular and persistent stories that midway to the destination, the bus made a stop in the middle of the steppe, letting the cosmonaut to get out and relieve himself onto a tire. However all agree, that the atmosphere on a bus was very joyful, confirmed by a film footage where a fellow cosmonaut puts a candy into Gagarin's mouth. Upon arrival at the pad around two hours before launch, the cosmonauts' training instructor Yevgeny Karpov was first off the bus to help Gagarin and Titov to disembark. Gagarin was met by General Kerim Kerimov and the head of the State Commission Konstantin Rudnev among others, to whom he made an official report about his readiness for the flight. In the company of leading engineer Oleg Ivanovsky, who just came down from the service gantry, Gagarin climbed around a dozen steps of a legendary stairway toward the elevator which then went up along the arm of the transporter erector to the top of the rocket. 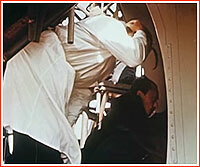 Along with Ivanovsky and life-support engineer Fyodor Vostokov, Gagarin emerged from the elevator at the top of the launch vehicle. 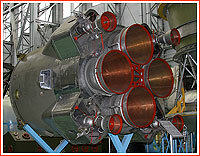 He was met by technicians Vladimir Morozov and Viktor Skoptsov. Gagarin waved another goodbye from the top of the gantry and walked to the capsule. Two junior officers from the missile forces and a movie cameraman were also on hand. Held by Ivanovsky and Vostokov on two sides, Gagarin got into the cabin. Once onboard, Gagarin flipped a few switches and established communications with the launch control room with Pavel Popovich on the other end of the radio link. The Ozon-SM data recorder was first activated at 07:20 providing information on Gagarin's condition during pre-launch operations until 08:45. Ivanovsky by the hatch could hear exchanges between Gagarin and Popovich through a speaker in Vostok's cabin, until Gagarin switched the audio to his headphones. Ivanovsky then called Korolev and told him that they were ready to close the hatch and got green light. Ivanovsky, Morozov and Skoptsov lifted a nearly 100-kilogram cover, put into the position and tightened 30 bolts first by hands and then by special keys in a symmetrical fashion to ensure an even seal. Despite practicing this operation many times, this time, one of three lights confirming the arming of the hatch jettisoning mechanism for the ejection would not light up in the launch control bunker. Korolev called Ivanovsky and asked to re-open and close the hatch again. "C'mon guys, let's open the hatch," Ivanovsky told his technicians, who looked at him in total bewilderment. After they re-opened the hatch, Ivanovsky checked the contacts, which looked fine, but he still adjusted the problematic one slightly with a screwdriver. As they were re-installing the hatch, Ivanovsky got a glimpse of Gagarin's face reflecting in his spacesuit sleeve mirror, as he held up his left hand to see what was going on. Shortly after they re-installed the hatch, their intercom called again. 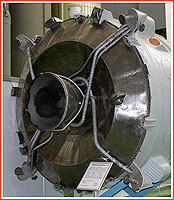 From downstairs, Korolev said that everything was in order for pressurization checks. Technicians fitted a special device on top of the hatch to check for leaks. This time, everything worked fine and via the announcement system, the launch personnel was ordered to clear the pad and Gagarin was left alone at the top of the fueled rocket to face History. Gagarin's launch vehicle blasted off into the cloudless blue sky almost as scheduled, just a fraction of a second before 09:07 Moscow Time. Several thousands of military officers, soldiers, technicians and engineers spread over various facilities of the top-secret test range later known as Baikonur witnessed the roaring vehicle rising over the steppe and heading eastward. Two and a half minutes after launch, the payload fairing, covering the spacecraft split in two petals with a powerful jolt and fell away, revealing to the pilot a breath-taking view in the lower window. "Beautiful," Gagarin exclaimed, after seeing one of the petals of the nose cone slowly tumbling away from the rocket backdropped by the magnificent surface of the Earth. Five minutes after launch, the main engine of the core stage shut down, while four small vernier nozzles continued firing for a few more seconds fine-tuning the enormous speed of the rocket to a needed 5.5 kilometers per second. (51) For Gagarin, the heavy loads of acceleration and powerful rumble sharply turned into 10-15 seconds of weightlessness. 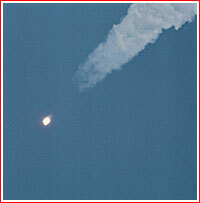 Then the third stage fired with a bang and moments later, the spent second stage separated. It was the job of the third stage to accelerate spacecraft to the almost eight kilometers per second needed to reach orbit some 10 minutes after the liftoff. 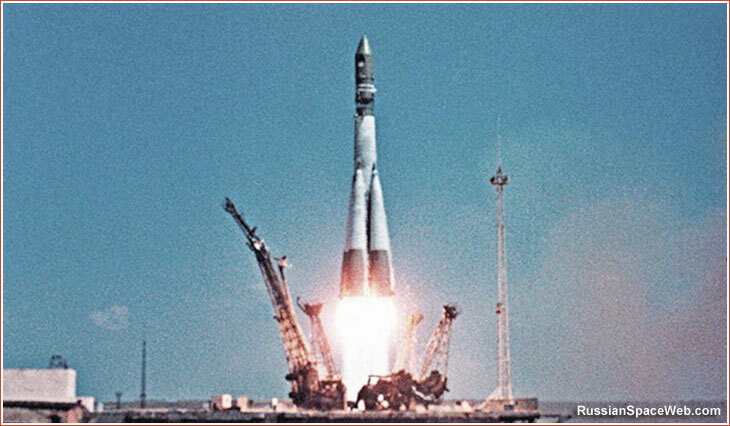 According to Korolev around 13 minutes after launch, he had confirmation that the first man from Earth had reached the Earth's orbit. (469) The question remained what kind of orbit it was! For decades, countless books repeated each other, claiming that Gagarin's launch was flawless. Only by the end of the 20th century, did the truth start to emerge. Later calculations showed that Gagarin's orbit was 327 kilometers above the Earth's surface in its highest point (apogee), instead of the planned 230 kilometers. (464) However, the situation apparently would not become clear until after the mission. Even if everything went as planned, the higher-than-normal orbit could still affect the flight. Immediately after the separation from the third stage of the launch vehicle, a special timer called PVU Granit was activated onboard Vostok, counting down toward the firing of the braking engine. Probably as a result of the higher, (and consequently longer) orbit, the timer was now programmed to start the deorbiting maneuver slightly ahead of the correct point. In turn, the premature reentry would shift Gagarin's touchdown point forward, short of its target. Gagarin during medical checks on the morning of April 12, 1961. 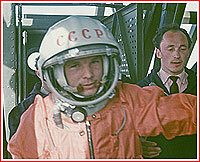 Gagarin during suiting up operations before launch. Gagarin arrives at the pad. Yuri Gagarin walks toward the launch vehicle on the pad. Korolev is on the right. 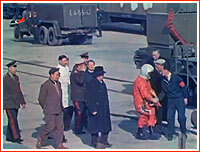 Ivanovsky shakes hands with Gagarin before climbing to the spacecraft. Gagarin climbs the stairs of the access gantry on the way to the elevator with Ivanovsky on his left. 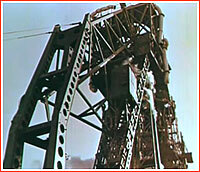 Gagarin rides an elevator to the top of the access gantry. 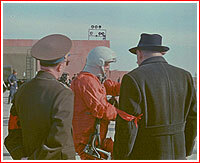 Gagarin at the top of the access gantry is preparing to board Vostok, with Ivanovsky on his left. Technicians working to close the hatch on the Vostok.